As a hamster owner, there are various circumstances you may get yourself in that may or may not lead you to have questions about baby hamsters. The most asked questions will be handled here. I just bought a hamster and I think she is pregnant. My newly acquired hamster just gave birth. What do I do? For the above circumstances, you can avoid. Simply get your hamster from a reputable breeder. See the pros and cons here. It is very rare to obtain a pregnant hamster from a reputable breeder. There is, however, a chance of getting a pregnant hamster from Adoption, rescuing or ignorant pet stores. 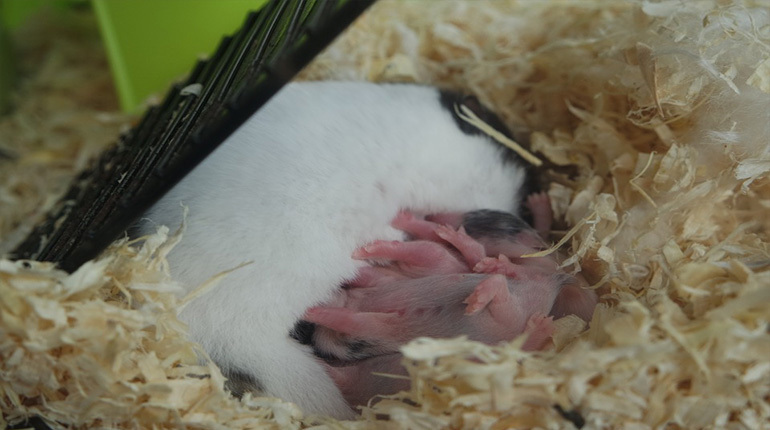 You think your hamster is pregnant, but you are not sure….or You did not get a chance to prevent and your hamster just gave birth. What do you do? In the case of pregnancy, you will need your hamster savvy vet to confirm. The good thing about having your vet confirm pregnancy is that you will know how long your hamster has been pregnant and when she is most likely to give birth. You may also get advice. You may also get time to weigh your options. What are these options? Can you provide the necessary resources to make sure that the hamsters live comfortably and healthy? Remember that a Syrian hamster lives alone and cannot share a cage with another. This means you will have to get different cages for each baby hamster. Dwarf hamsters may share a cage but you have to be careful and watch them to make sure they are friendly, otherwise they may fight. Do you have space in your house for the cages? Do you have enough money to cater for feeding, bedding and accessories? Do you have enough time and energy to clean all the cages? If you cannot keep the baby hamsters, what do you do with them? The best advice we can give you is look for a reputable hamster breeder and give the baby hamsters to him or her. This is why. You want the hamster to receive the best care possible. Breeders have seen it all and know what to do in all cases. Pet stores do not have the best track record when it comes to this. If there are some reputable pet stores, they are not many. Again, giving your relatives the baby hamsters or selling them is not a good decision either. They may not be well taken care of, maybe if you educate them on how to correctly care for hamsters. Before giving the baby hamsters to a reputable breeder there are some things you need to know. Give plenty of food and fresh water. What food should you give?